New time! ... Saturdays, noon to 1 p.m. ET on WICR 88.7 FM. Their percentage of the Indiana population is still relatively small, but immigrants from Colombia and Venezuela have grown explosively here - and across the country - during the last 20 years. So Hoosier History Live! will explore immigration from the two South American countries during the next show in our rotating series about the ethnic heritage of the Hoosier state, which has included looks at German, Irish, Scottish and Greek immigration here. Nelson will be joined in studio by Venezuela native Marco Dominguez, who co-anchors the Spanish-language news webcast launched this summer by WTHR-TV/Channel 13 in Indianapolis. Our guests also will include Fishers resident Bertha Torres, a native Colombian who is past president of the Friends of Colombia Society, and Danny Lopez, executive director of the Indiana Commission on Hispanic/Latino Affairs. Danny, who is of Cuban heritage, joined Nelson last May for our show about Cuban immigration to Indiana; because of his statewide position, he has informed perspectives about an array of Hispanic communities. "In all, there are three times as many Colombians as Venezuelans in Indiana," Danny reports. He notes that Colombian immigrants are most heavily concentrated in Lake County and Marion County, whereas their Venezuelan counterparts have tended to settle in north-central Indiana and in Hamilton County. Our guest Marco Dominguez immigrated from Venezuela to Indiana twice, beginning in the 1980s to study at Vincennes University, then at Butler University. 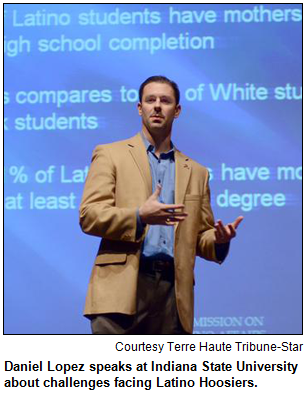 He is former station manager for Univision in Indianapolis and is community sales director for the Finance Center Federal Credit Union. 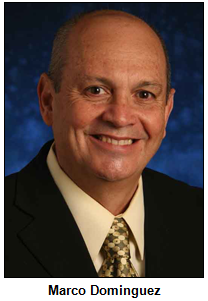 A pioneer in Hispanic media in Indiana, Marco was a producer for WTBU, Butler University's TV station, for eight years. Our guest Bertha Torres met Manuel A. Torres, her husband of 53 years, when they were children in Bogota, Colombia's capital city. Because Manuel Torres had a long career in the U.S. Army, they lived everywhere from Germany to San Francisco (as well as in Indianapolis during the 1970s when he worked at Fort Benjamin Harrison) before they settled permanently in central Indiana in the early 1980s. Bertha is retired after a varied career, including a long stint at P.R. Mallory and Co., the now-closed, Indy-based electrical components manufacturer where she oversaw the international/exports division. Bertha and her husband are the parents of three grown children. According to information supplied by our guest Danny Lopez, much of the Venezuelan immigration has occurred during the late 1990s and early 2000s. In fact, almost 75 percent of Venezuelans living in Indiana came during that period, a trend that many analysts link to the ascendancy of Hugo Chavez, the controversial president of Venezuela. Venezuelan immigration, in fact, is said to mirror (on a smaller scale) earlier waves of Cubans, with both groups having higher-than-average levels of education and financial resources. Statistics supplied by Danny indicate about 3,890 people who describe themselves as Colombian live in Indiana. However, he notes wide discrepancies between estimates about immigrants from the Colombian and American governments. The average Colombian in this country, according to Danny's information, is 34 years old; for the overall Latino population here, the average age is 27. In addition to exploring immigration patterns, Nelson and his guests will share insights about the culture, impact, contributions and challenges of Colombians and Venezuelans here. He also will ask Bertha and Marco to share their personal stories about coming to the Hoosier state. In the Indianapolis area, native Colombians who have become civic leaders include a vice president at Key Bank; the physician-founder of Alivio Health Center, a clinic that provides medical care for a range of Hispanic residents, and an extension educator for Purdue University. At the Indianapolis Motor Speedway, several Colombian and Venezuelan drivers have become familiar to racing fans. 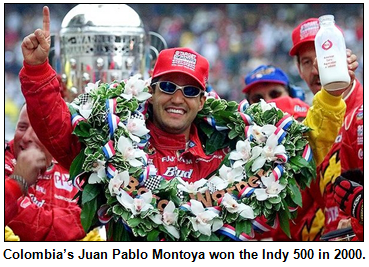 They have included Juan Pablo Montoya, a native of Bogota who won the Indianapolis 500 in 2000. In 2007, he switched to NASCAR racing; three years later, Montoya was the pole sitter for the Brickyard 400. Other drivers in recent Indy 500s have included E.J. Viso and Milka Duno, both from Venezuela. During the 1980s, popular Roberto Guerrero, a native Colombian, was the runner-up at the 500 twice. According to information from Danny, 29 percent of Colombians in the United States have at least a bachelor's degree. That's far higher than both the overall American population and the overall Latino population. During the early 1960s, children who were evacuated from Cuba because of the Fidel Castro regime were brought to more than two dozen American cities designated as havens. The cities included one in Indiana where Catholic parishes and social service organizations had stepped forward to assist Cuban families. 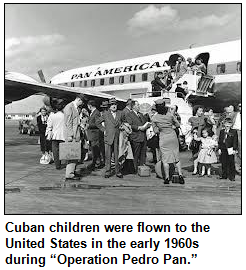 Because of the city's significant role during the Cuban evacuation of children - a project often referred to as "Operation Pedro Pan" - Cubans have had a more significant presence in the Hoosier city ever since. Question: What is the Indiana city? Hints: It is not South Bend, where Cubans also have been a significant presence for generations, generally attributed to Cuban students and alumni of the University of Notre Dame. The other Indiana city - which played a role with "Pedro Pan" children from Cuba - was mentioned on Hoosier History Live! by our guest Danny Lopez during a show last May about Cuban immigration. This week's prize is two tickets to the 1836 Outdoor Adventure and Winter Fun Days at Conner Prarie, two tickets to the Benjamin Harrison Presidential Site, and two tickets to the Indiana Experience, courtesy of Visit Indy. Chris Gahl of Visit Indy suggests that we enjoy Tchaikovsky's magical holiday music with a performance of The Nutcracker at the Tobias Theater at the Indianapolis Museum of Art the weekend of Dec. 14. 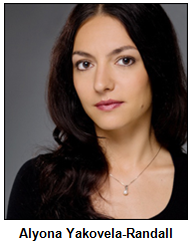 The Indiana Ballet Conservatory will stage the classic Christmas ballet under the artistic direction of Alyona Yakovela-Randall. The Indianapolis School of Ballet's performance of The Nutcracker will be the weekend of Dec. 21 at Indy's Scottish Rite Cathedral in a set that recreates Indy's Victorian-era mansion, the Morris- Butler House. Please take time this holiday season to enjoy our local performers and dance organizations! Please tell our sponsors that you appreciate their support: Aesop's Tables | Conner Prairie | Indiana Historical Society | Kurt Vonnegut Memorial Library | Lucas Oil | Story Inn. Acknowledgments to Print Resources, Monomedia, Indiana Humanities, Visit Indy, WICR-FM, Fraizer Designs, Heritage Photo & Research Services, Derrick Lowhorn and many other individuals and organizations. We are an independently produced program and are self-supporting through organizational sponsorships, grants and through individual tax-deductible contributions through Indiana Humanities. We do not receive any government funding. Visit our website to learn how you can support us financially. If you would like to make a contribution to support the ongoing work on Hoosier History Live!, visit the website, where you can click to give. 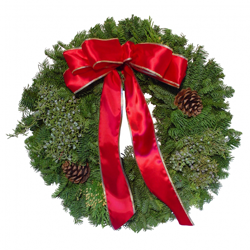 Remember that you also can memorialize a loved one with your contribution. Be sure to include your name and return address so that you can receive a tax donation receipt from Indiana Humanities. 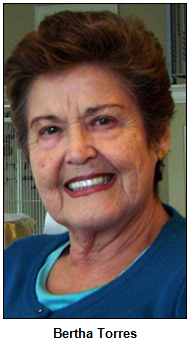 Thanks to new 2012 individual donors Rosalind Wolen and Stacia George. Thanks to all - including our wonderful sponsors - who have helped keep Hoosier History Live! up and running! Take a turn in the spotlight, Tipton County. Not only is there a new visual history book about your history, but a documentary is also in the works about the farmhouse owned by ancestors of President Barack Obama that's located near the tiny town of Kempton. Speaking of our commanders in chief: Did you know Teddy Roosevelt gave a rousing speech to a crowd in Tipton in 1902? Not long afterward, the Rough Rider was hustled to St. Vincent Hospital in Indianapolis for surgery on an injured leg. That presidential trivia comes courtesy of Images of America: Tipton County (Arcadia Publishing), a visual history book by Tipton-based writer Janis Thornton, who will join Nelson in studio. Shawn joined Nelson for a Hoosier History Live! show about the historic homestead in the spring of 2009, almost exactly a year after Obama (then just a candidate for the Democratic presidential nomination) visited the spacious farmhouse accompanied by his wife Michelle and their two daughters, with about 100 journalists in tow. Shawn is returning as a guest to share updates because so much has unfolded since his initial appearance on our show, including the documentary under way titled A Single Root. Janis covered the headline-making visit because she then was an editor at the Frankfort Times newspaper, although she grew up in Tipton. 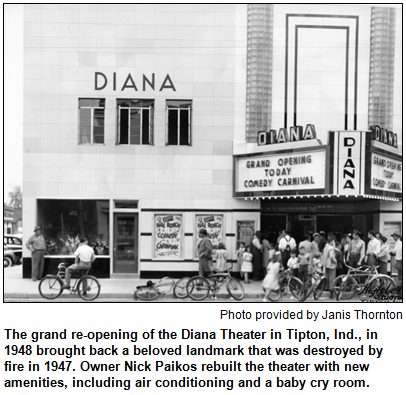 As a teenager, her first date was at a hometown landmark that has become a rare breed: An independent, locally owned cinema house (with a vintage marquee) called the Diana Theater. Built by a Greek immigrant to Tipton in 1926, the Diana was devastated by a fire in the 1940s but was quickly rebuilt (with the added enticement of air conditioning) and continues to be run by a descendant of the original owner. Also during the 1940s, the Tipton County town of Windfall was the setting for a World War II prisoner-of-war camp. Thanks to the help of the Tipton County Historical Society, Janis was able to obtain a rare photo taken inside the camp, which became a temporary home for hundreds of captured Germans. 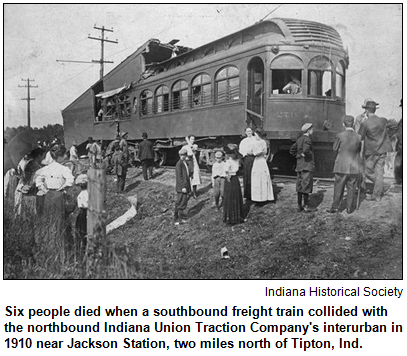 During our show, we also will explore the significant impact of railroads on Tipton (in 1910, there was a tragic collision between a freight train and an interurban, resulting in half a dozen deaths) and the annual event for which the town probably is best known across the state. That's the Tipton County Pork Festival, which the community has hosted for more than 40 years. The festival draws tens of thousands of visitors to the lawn of the Tipton County Courthouse and surrounding streets. In her book, Janis refers to the county's signature commodity as "a hot, juicy, barbecued pork chop."